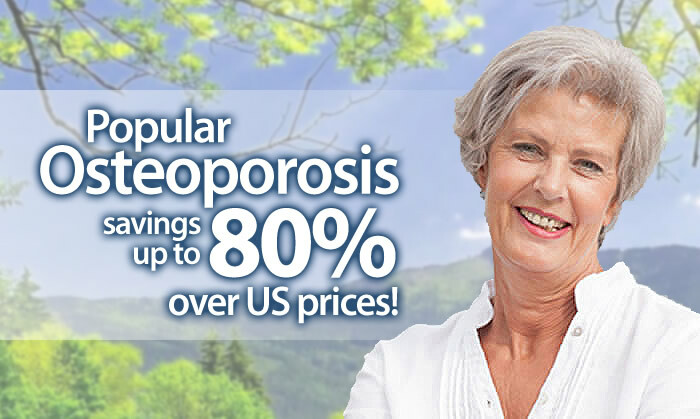 We carry generic versions of popular Osteoporosis Treatments such as Boniva, Fosamax and Actonel . We also stock many generic bone loss treatments that can be found on this page. Osteoporosis medications that we carry require a prescription from your doctor and can not be legally sold over the counter. Ibandronate Sodium the generic for Boniva is in a class of medications called bisphosphonates. Most commonly prescribed as prevention and treatment for osteoporosis in women after menopause. Ibandronate works by increasing bone mineral density (BMD) and reduces the incidence of fractures in women, men should not take ibandronate. Alendronate the generic for Fosamax is in a group of medications called bisphosphonates, and they decrease the activity of cells which break down bone. Fosamax is used to prevent or treat postmenopausal osteoporosis and steroid-induced osteoporosis. Alendronate may also be used to treat Pagets disease of bone. It works by modifying the cycle of bone formation and breakdown in the body. Fosamax reduces bone loss while increasing overall bone mass, preventing bone fractures in many who take Alendronate on a regular basis. Premarin / Premarin Cream (Conjugated Estrogen), is available in Brand-Name and Generic forms. Global Pharmacy Plus offers you Premarin / Premarin Cream, Conjugated Estrogen in Tablet form. Premarin® / Premarin Cream®(Conjugated Estrogen) is used to treat hot flashes and other symptoms of menopause or low amounts of estrogen.